Interroll Conveyor Modules are smart, economical, and flexible. 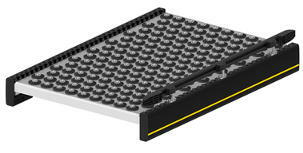 Their Modular Conveyor Platform is among the most versatile and durable conveyor technology available. They are designed for future growth, assuring you the highest in scale-ability and availability. 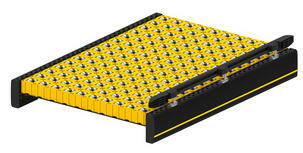 Interroll’s new conveyor modules are cost and energy efficient while including the convenience of a plug and play system. 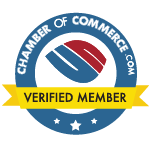 Standardized components are included for easy on-site installation, reducing planning and installation. As a trusted partner, Interroll, assures future availability from their time tested and proven open platform conveyor system. The Interroll non-powered “RM 8110 Straight Roller Conveyor” easily transports materials, manually or with gravity, down a incline or slope and is used in an assembly or picking line. 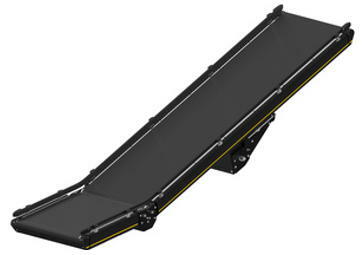 The Interroll non-powered “RM 8120 Curve Roller Conveyor” is used to change the direction of products and materials, where product is manually pushed along the curve. Product alignment is maintained with side frames and tapered rollers. The Interroll Non-powered “RM 8130 Ball Table” easily transports solid bottom products and materials in all directions with very little force. These are especially suitable in workstation and inspection areas. 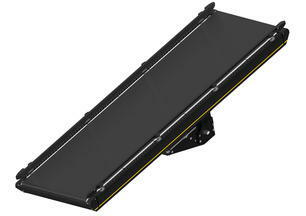 The “RM 8130 Ball Table” is installed in a standard side profile and easily combines with other conveyor modules. The Interroll “RM 8140 Omni Wheel Table” is constructed with multi directional wheels and is well suited for inspection and workstation areas. The Omni Wheel Table is well suited for soft bottom products that need to be moved in any direction with very little force. 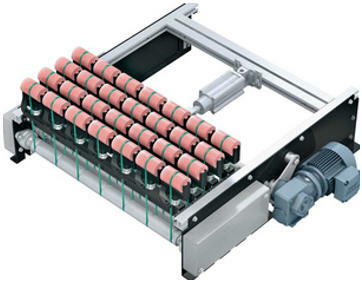 The Interroll Powered “RM 8310 Straight 24 V Roller Conveyor”, combined with a controller, enables “zero pressure accumulation” transportation of unit loads. Each zone is powered by a 24 Volt RollerDrive, connected to a fixed number of idlers by “PolyVee” belts. 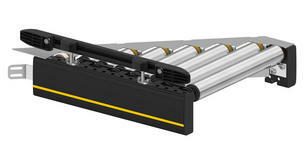 The Interroll Powered “RM 8320 24 V Roller Curve Conveyor” changes the direction of transported products and materials. Tapered rollers maintain material alignment between side frames. A controller module enables “zero pressure accumulation” transport. Each zone is powered by a RollerDrive connected to a fixed number of idlers by round belts. The Interroll Powered “RM 8330 Merge” merges conveyor lines by placing materials and products in the gaps in the material flow. 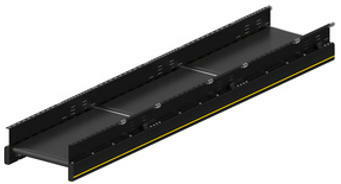 Additionally, the “RM 8330 Merge” can divert materials from a straight conveyor, by using a “High Performance Divert”. The Interroll Highspeed Popup are excellent at diverting unit loads in 30° or 45° angles onto a continuing conveyor line without the need to interrupt the flow. 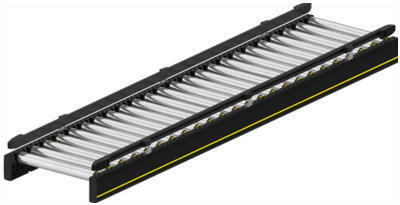 The Interroll Powered “BM 8350 Straight” Belt Conveyor Light is a belt conveyor, divided into zones with zero pressure accumulation. Its drive consist of the 24 V RollerDrive. The “BM 8350 Straight” can transport and accumulate small materials and products not suitable for roller tracks. Note: This unit is not suitable for reverse direction operation. 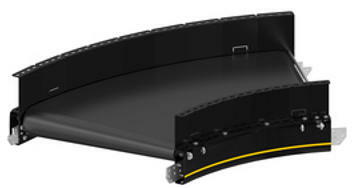 The Interroll Powered “BM 8360 Belt Curve Light” is a belt curve that is divided into zones with zero pressure accumulation. Its drive consist of the 24 V RollerDrive. It can transport and store small materials and products that are not suitable for roller tracks. Note: This unit is not suitable for reverse direction operation. The Interroll Powered “BM 8410 / 8420 Straight, Head Drive” belt conveyor is useful to transport unit loads not suitable for roller tracks, including all types of unit loads in inclines and declines.These belt conveyors are equipped with the BM 8420 drum motor. A BM 8410 gear motor is available as an option. Note: This unit is not suitable for reverse direction operation. The Interroll “BM 8411 / 8421 Straight, Center Drive” belt conveyor is useful to transport of loads not suitable for roller tracks, and for types of loads in inclines and declines.The belt conveyor is equipped with a BM 8421 drum motor. A BM 8411 gear motor is available as an option. Note: This unit is not suitable for reverse direction operation. 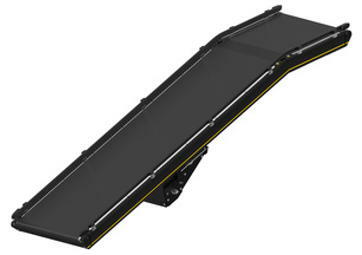 The Interroll “BM 8432 / 8442 Straight, Center Drive + Top Arch” belt conveyor with top arch for transport of all types of loads for inclines or declines. The arch reduces noise and material impact as they pass over it.This belt conveyor is equipped with the BM 8442 drum motor. A “BM 8432” gear motor is available as an option. Note: This unit is not suitable for reverse direction operation. The Interroll “BM 8433 / 8443 Straight, Center Drive + Feed” belt conveyor with feed for transport of all types of loads for inclines or declines. The feed section enables a smooth transition at the lower interface with a roller conveyor.The belt conveyor is equipped with a BM 8443 drum motor A BM 8433 gear motor is available as an option. Note: This unit is not suitable for reverse direction operation. 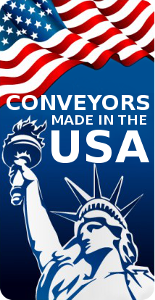 If you have a request for any module or component not listed on this page, please call (866) 403-5232 (toll free) and ask to speak with an ACG Conveyors sales representative.